If you received the email, and your facility uses SimpleConnect™ to transmit your MDS data to CMS, be assured that your data has been submitted to CMS. You can check your final validation files if you want to verify this. 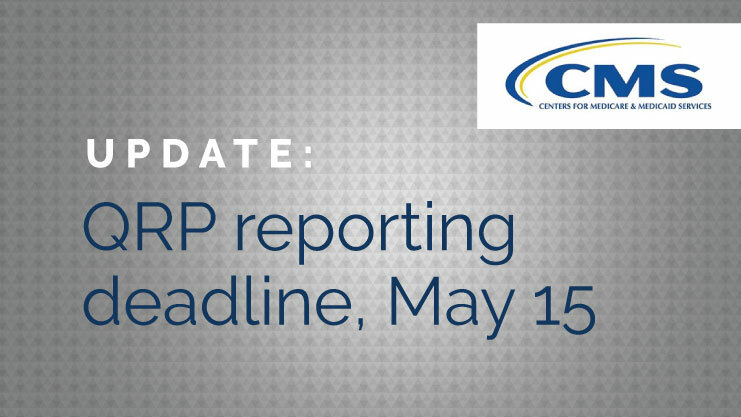 However, please read the email carefully, because it may list one or more of the QRP reporting measures that have not been submitted for your facility. If your MDS data did not include QRP data for the last quarter, this may or may not be related to your unique resident population, admit/discharge timing, etc. If you’re unsure about the status of your QRP data, or have questions about QRP reporting requirements or deadlines, email the CMS Quality Help Desk at SNFQualityQuestions@cms.hhs.gov. You can also see the SNF QRP Quick Reference Guide. We are reaching out to remind you that the upcoming submission deadline for the Skilled Nursing Facility (SNF) Quality Reporting Program (QRP) is approaching. Minimum Data Set (MDS) assessment data for October-December (Q4) of calendar year (CY) 2016 are due with this submission deadline. All data must be submitted no later than 11:59 p.m. Pacific Standard Time on May 15, 2017. SNFs are required to submit quality reporting data each quarter to meet QRP reporting requirements. Failure to submit data prior to the submission deadlines may result in a two percentage point reduction in the Annual Payment Update. Please submit your data and check the appropriate CASPER reports for errors prior to May 15, 2017, in order to ensure that all required data has been submitted. Detailed guidance on how to run and interpret MDS reports can be found in the Helpful Hints Fact Sheet at https://www.qtso.com/download/mds/MDS_3.0_Helpful_Hints.pdf. Only complete, successful submissions will count toward your Annual Payment Update requirement. Providers are also encouraged to verify all facility information prior to submission, including their CCN and facility name. There are several tools on the CMS website to assist with your submission. The following link will allow access to Skilled Nursing Facility Quality Reporting Program website: https://www.cms.gov/Medicare/Quality-Initiatives-Patient-Assessment-Instruments/NursingHomeQualityInits/Skilled-Nursing-Facility-Quality-Reporting-Program/SNF-Quality-Reporting-Program-IMPACT-Act-2014.html. CORMAC is contracted by CMS to provide outreach and share important reminders with providers for the IRF, LTCH, SNF, and Hospice Quality Reporting Programs.